For as much creativity and immersive artistry that has emerged in the last decade, one aspect of the entertainment business has continued to suffer, almost, ironically, in silence. I’m talking about pop music, specifically it’s more electrified rock n’ roll realm. Pop’s heavier side has been going through some particularly rough times since the fusion of electronic and urban subgenres to create super-scenes that know no boundaries both sonically and geographically. While this has undeniably been good for music as a whole, it’s stamped out the flame that once burned within rock music. 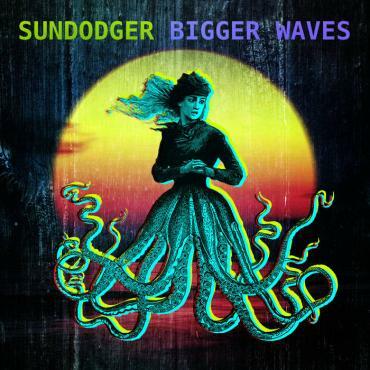 But this year, with their new album Bigger Waves, Seattle’s Sundodger are reigniting that flame with a passion that is unparalleled in all of music today. Bigger Waves is classic, dirty Seattle garage rock pumped out at maximum volume with more low-end than more bands are comfortable unleashing. I definitely wouldn’t call this post-grunge, but it’s still under the larger umbrella of alternative rock itself. When listening, what I gathered from both its presentation and the design of the band’s songs more than anything else was that old school, classic rock vibe almost being re-imagined to suit today’s modern day sound and format. It would be wrong for me not to acknowledge the fact that despite pop’s general marginalization of rock, there have still been bands working to keep rock music’s identity and devotion to distortion alive, it’s just that none of them have been doing it as well as Sundodger does. This is a truly airtight collection of solid, hard rocking jams, but there is one thing that is absent from Bigger Waves that is overwhelmingly noticeable. There aren’t any stupid, predictable metaphors. While many of their contemporaries have been content to celebrate the one aspect of rock music that has always hurt its aesthetic – big ego – Sundodger in this instance has evolved ahead of the curve. Mainstream radio needs more rock music made in this decade, not by a bands that rely more on computer software than they do actual instruments. Sundodger have stayed loyal to the ethics and way of life that made the greatest albums of all-time as great as they are. All it takes is some people who share a dream and a vision of how to get there, some solid body guitars, a drum kit and a bass to cement everything together. It might not seem like it to some, but I think that Sundodger meant to send a clear message to the world with Bigger Waves. That message is, in essence; look out, we are the new face of Seattle, the new sound of rock music. It’s a lot to live up to, but Sundodger are off to a pretty excellent start.